Everything comes up red, white, and blue during this July 4th week events calendar. The City of Edmond and the University of Central Oklahoma host the 40th annual LibertyFest with activities lasting from June 28th through July 4th. The festivities begin Thursday evening with a “Concert in the Park” outside of Mitchell Hall Theatre featuring the UCO Summer Band. Events leading up to Independence Day include “Chalk-It-Up,” a car show, scholarship pageant, Kite Fest, a road rally through the city, and more throughout the weekend. The 4th of July begins with a parade through downtown Edmond at 9:00 a.m., continuing with ParkFest at UCO, and concluding with fireworks at 10:00 p.m. The Stars and Stripes River Festival in the Boathouse District of Oklahoma City celebrates America’s independence and the upcoming Summer Olympic Games this Saturday and Sunday. Olympic Day Activities such as demonstrations in cycling, running, canoeing and kayaking led by Olympic athletes run from 9:00 a.m. to 5:00 p.m. Children can participate in volleyball, sack races, horseshoe competitions, face painting, and play on inflatables throughout the day as well. The evening ends with live music by Denver Duncan, At Long Last, and Brian Dunning and the Rock ‘n Roll Trio and fireworks at dusk. Oklahoma City’s July 4th celebration, Red, White, and Boom, takes place at the entertainment plaza of the State Fair Grounds in its sixth year, as opposed to the downtown ballpark in years past. The Oklahoma City Philharmonic begins its Patriotic Pops show at 8:30 p.m. on July 3rd. Joel Levine conducts the orchestra in a concert celebrating the United States including classic pieces such as “America the Beautiful,” “The Battle Hymn of the Republic,” and “Stars and Stripes Forever.” The evening rounds out with a fireworks show. Participants are encouraged to bring their own seating. Storyteller Al Bostick presents “In the Dreamtime” at the Mustang Public Library on June 28th at 2:00 p.m. He performs stories and legends from Australia as part of the library’s Summer Arts Series. The Oklahoma City Indian Clinic’s Children’s Health Fair takes place June 29th and 30th for ages 4 to 18. Physical exams and other screenings, including vision and hearing, are available. Local band Horse Thief kicks off their tour with a show at The Opolis in Norman on Friday, June 29th with additional bands the Gentle Art of Floating and Samurai Conquistador. 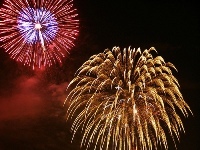 Music begins at 9:00 p.m.
For a complete listing of Independence Day events throughout the state, click here or visit the calendar page of our website.